This is what greeted me at Canyon Village on May 12. Though I know snow (since I am from northern Minnesota) I had gotten used to spring. It appeared I was going to have to learn how to enjoy winter for at least a while longer. 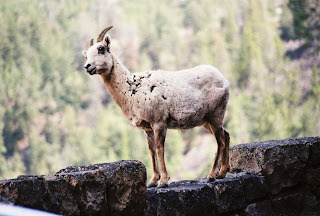 This was taken on the North Rim Trail during one of my hikes with Carl. We were hearty souls as we had a picnic in the snow at Fishing Bridge on May 16. This is me showing my 4th of July spirit with Crazy Hat Day. They show me at my post in the Bullpen. I snapped this picture of the group as I walked away from them. That was about 1 minute before the bison charged. Since then I have been contacted by someone who was in the group also. He had been searching youtube for the video we all assumed would be posted on the incident (he hasn't found one either) when he came across my blog. He wrote about his experience that night and he also concluded that it was one of the most terrifying experiences in his life. Because of that night I am sporting a bison pin on my work uniform so I will always remember it (like I could really forget that night). This was the first grizzly I saw on Dunraven Pass right after it opened this year. Carl loves to fish and by chance I came upon him fishing on the Yellowstone River. I hiked down to him and we ate our lunch together on the bank of the river. A common sight in Mammoth is the elk roaming the streets. Here is some mama elk with their calves relaxing on one of the lawns with the Mammoth Hotel in the background. Sometimes rangers need to come out because the elk decide to hang out right by the entrance of the hotel preventing people from entering and causing some people to get too close. Luke, Dave & I pose with my car in front of a snowdrift in Hayden Valley a couple days after we started in May. This is once of those cases where it was an incredible scene but the picture turned out blurry. Darn. I had been held up for almost an hour as a portion of the herd in Hayden Valley walked across the road and then ran for the river and swam across. It was getting dark but I managed to be in a location where I could watch them enter the river and swim. There was a lot of groaning, snorting and splashing. It was a great moment. I couldn't resist setting my camera on a timer and running out amongst the blooms to have a picture taken. The mountains are covered in beautiful purple, white and yellow flowers. I once got a chance to watch a grizzly walk around in a sea of yellow. It was one of those moments where I was so transfixed on the scene that I actually forgot to take a picture of it. One of the Magnificent Seven enjoying himself holding up traffic. This was my first hike of the year. Carl had taken me on an impromptu hike to Trout Lake. Lately I have been hearing reports of the otters and their babies being very active there. They have been putting on quite a show for everyone who takes this short hike. While Carl and I were watching the spawning trout at LeHardy Rapids this pelican flew in to do some fishing. The pelican has become my favorite bird in Yellowstone. And lucky for me there is a lot of them to watch. That is Carl standing there at the brink. He is my hiking partner and the most knowledgeable person on Yellowstone that I know. This was taken on May 16, 4 days after we started at Canyon. We had gone to Hayden Valley after work to look for grizzly bears. This picture was taken fairly early in the morning as I was heading south. Obviously there wasn't too much traffic. Anyone who has been in a bison jam knows that they can be miles long on each side. I did turn around at this point, I could tell this was going to be a very long wait as the bison were moving very slowly (if at all) across the road. Sadly, this is one of many pictures that I have of people getting much too close to the wildlife. With family members having health issues I decided to return to Minnesota for a couple of days. I drove 880 miles (14 hours) straight through. I left yesterday morning at 5:00 and will start back to Yellowstone Saturday morning. It was a strange feeling driving through the park with only a bit of light shining through the clouds. I could see the steam rising off some of the thermal features and I paid careful attention to what was on the roadway ahead of me. I have never really been too excited at the prospects of driving in the dark in Yellowstone but luckily for me there was no sign of the Magnificent 7 on the roadway (or anywhere near it for that matter), only a herd of elk in the distance by a lake south of Mammoth. There seems to be a bit of truck traffic on the roads at that time of the morning. Probably early deliveries for the concessionaires in the park. The drive was pretty uneventful but for some road construction and showers in North Dakota. When I return I will have my friend Denise with me. She has never been to Yellowstone and thought that with me returning she might as well come along for the ride and catch a plane home next Wednesday from the Jackson Hole airport. During my hours off from work I am hoping to show her my favorite wildlife viewing areas with hopes that a grizzly or a wolf will make their appearance. One bonus of being out of the park is faster internet and the ability of uploading pictures. That is my next project. After quite a few days of frustration I finally was able to load and update my blog. Success!! My wildlife sightings have been close and numerous. The bison and elk by the dorms have been creating quite a stir. The bull elk likes to lay down and chew his cud in the trees behind the dorm but the tourists seem to find him still. Cars and people swarm the dorm and snap pictures. Linda even once shouted out her window for people to get away from him. Good for her as they were about 5 feet from him and his huge rack. I managed to find myself in the worst bear jam ever. Just north of Chittenden Road cars had stopped in both lanes with only 1 skinny path between them when a grizzly roamed the hillside. For anyone who has ever been on this road knows that it winds around the mountainside and is quite narrow as it is. It took some maneuvering and time but I managed to make my way through and I even managed to see the grizzly (no pictures though). The last I saw he was making his way towards the road and people were scattering. Last Friday night I went over to John & Jackies for a great meal that John made with shrimp, potatoes and sausage. It's always fun to sit around with co-workers and shoot the breeze. Grance and Glen left on Sunday morning and I sure do miss them. They headed back to Michigan and I promised Glen I would take care of the flowers that Grace has been watering in front of the store. Yesterday I took Frankie and Bobby over to Norris Geyser Basin during our afternoon break. They are from China and don't get to see the sites very often. We stumble through our language barrier fairly well (I did have to play a pseudo game of charades on how to roll down the window in the car). They were both impressed with the thermal features and Frankie filmed the entire time we were there. Last night Carl, Frankie, Bobby, Hoa, and myself went to Hayden Valley. Frankie and Bobby had not seen a bear yet and we managed to spot one as soon as we got into the valley. I used 'Spot' (my nickname for my scope) and they all got a very nice view of him. Further up the road we hit a bison jam and spent 45 minutes sitting in the car in the rain moving rather slowly. I eventually turned around when I saw that the line of cars went from Trout Creek past Sulpher Couldron. We went back to where we saw the bear and visited with an American who now lives in Germany. Sickness has been spreading through the dorms. On Saturday we were missing a few people from my shift. We had another dorm meeting on hygiene. Yes, we actually have meetings on the reasons why people should not be washing their feet in the sink and why flushing a toilet is a good thing. We've even had to have demonstrations on how to properly use those paper toilet seat protectors. It even gets worse than that but I'll leave the rest to your imagination. When in West Yellowstone on Thursday I stopped at the book store and bought a copy of the new book 'Squatters in Paradise'. It's a wonderful and hilarious look at being a 'savage' in Yellowstone. It gives an insiders view as to what it is really like working in Yellowstone. It's reccommended reading for anyone who has ever worked here. I also got to eat a meal outside of the Park in over 2 months. Neil wanted to eat lunch in West Yellowstone and I was excited to try out some of the local cuisine. Unfortunately for me Neil had is sights on McDonalds. I relented and ended up eating at what could possibly be one of the most expensive McDonalds ever. I only had a fish sandwich which sat like a rock in my stomach and I ended up deciding to miss dinner that night. Once again, unfortunately for me, it ended up being BLT night!!! The most anticipated dinners in the EDR. I did get to drive the north loop and find one of the Magnificent Seven standing in the southbound lane holding up traffic. He didn't walk, he didn't move, he just stood there in his bison world with a long line of cars behind him. I was heading north and I managed to slowly pass him. Good Boy! Yesterday morning Carl and I went to LeHardy Rapids and I got to see some of the trout swimming upstream. I managed to even snap a few pictures of the fish in the water. I didn't get to see any of them jump out of the water but a sign by the river says that during peak spawning season a fish jumps up the rapids every 10 seconds. We walked along the waters edge and it was a beautiful morning to watch the trout. This morning I went outside with Bill, Craig and Hank to snap a few pictures of one of the Boys of Summer who was laying and chewing his cud in the trees behind the dorm. His huge rack was whacking away at the branches every time he turned his head. He is huge and gorgeous. And it also my sad duty to report the loss of one of the Boys of Summer. A few days ago one of them was hit by a car just south of here. His legs were broken and a ranger had to put him out of his misery. It's a terribly sad situation. I have lately been passing by the boys with only a mere glance at them. I guess I am just used to their presence. I will take the time to watch them more closely and appreciate them more as I don't know when one of the two remaining will no longer be around for all of us. I am once again sitting in the internet cafe. This time I have my new flash drive in hand that is loaded with all my pictures. Unfortunately, for some reason I am unable to upload them. Argh. Technology can be such a challenge sometimes. Yesterday I headed to Cody. I left at 8:30 am and when I headed into Hayden Valley where there was a huge fog bank across the valley. I wanted to take a picture of it but I didn't think that a picture would actually capture how huge and beautiful it was. As I headed out the east gate I was immediately greeted by a huge bull moose grazing off the side of the road. So many people want to see moose in the park but their numbers have decreased over the years since the fires of 1988. I am fortunate that I have seen 4 of them now. Great animals! Last night on my cruise on the north loop I watched a grizzly bear walking across a slope on the Blacktail Plateau. A grizzly sighting always causes excitement. I then took the Blacktail Plateau Drive and with some fidgeting with my camera I managed to figure out how to do time delay. This is great to figure out so that I can actually be in some of my pictures. Up to this point I have had to rely on asking strangers to take my picture (and I usually end up with my eyes closed or something along those lines so there are no retakes). This morning before heading into West Yellowstone with Neal (who is along for the ride and some shopping) I had to to delay my departure as a huge bull bison wandered into the park area behind the store. He drank from a puddle and then started demolishing a sapling by rubbing his head on it. I took pictures and videos as he finally wandered over to the dorm, up the sidewalk and then went behind the dorm. I'm glad that Neal spotted him before I ran outside and straight into him. On Sunday, while on a ranger led program, the ranger broke through the crust and his leg went into a thermal feature up to his knee. It is the spouse of one of my co-workers and it happened by Canyon and is one of the rangers that led the evening program I attended on fires. Supposably he went to Lake Clinic, on to Mammoth Clinic and then was flown to Salt Lake City and is now in Jackson Hole. You know how stories go, it will probably change, but that is what I know of the inicdent at this time. We are all hoping for a speedy recovery!!! Altitude Sickness took down our newest employee, Mike. He seems to be doing better now. I am glad that I haven't experienced any sickness since being here. Thursday, Friday & Saturday our store will be having a sidewalk sale. I will be working outside during the sale (bug spray provided) and I'm expecting it to be a fun time. I have Thursday off so I will only work 2 days of the sale. I already looked through some of the boxes that were shipped to us for the sale and there is quite a few interesting things that will be discounted. One can never have too many Yellowstone souveniers. Carl had the day off yesterday and came into the store last night all happy. He had been fishing at Hellroaring and had caught 11 fish. He rambled off a bunch of names for the flies he was fishing with (I love the names of the flies.....wooly bugger (or something along those lines)). He's quite the fisherman. Yesterday was the last day of the week for having early shift. I worked the register in groceries, which I rather enjoy, and everyone was in a great mood. The weather was perfect (77 degrees and sunny) and everyone was planning picnics and sightseeing. It was very steady so the time went by quickly. During my afternoon break I went to Hayden Valley and watched a bull bison swim the Yellowstone River. The current is moving quickly so with a lot of swimming, grunting and flowing downstream a bit he finally made it across and was greeted with cheers from the people watching. In the evening Carl and I had planned on going out to watch the wildlife. We decided to head to Hayden Valley. It has been rather quiet down there, very few bison left but there are herds of elk. Earlier this week Carl watched a pack of wolves take down an elk calf. It happened right after another herd of elk had chased them off. The stars, moon and sun must of been aligned perfectly because it was an incredible night of wildlife watching. Just south of Grizzly Overlook we watched a grizzly moving along the edge on the opposite side of the Yellowstone River. He eventually waded out into the river and the current quickly started moving him downstream. He just floated along but I'm sure underneath the surface of the water his paws were paddling like mad. I had grabbed my video camera so I got great video of the entire thing. He eventually made it back to shore and wandered off into the sage brush. Bridge. We've seen bears earlier this year by Steamboat Point. After driving for quite a distance without seeing anything we decided to use a turnout to head back. When we pulled into the turnout we found a grizzly roaming around and digging just over the edge. We watched him for quite awhile by ourselves and were eventually joined by others when they saw me videotaping. Looking to the northeast we could see a storm heading across the Canyon area. Lots of cloud to ground lightening strikes. We headed back. We missed the storm but did have another one overnight. This morning there was more rain and lightening but now the sky is clear and sunny. Another warm day is in the works. Carl and I have made plans to go down to LeHardy Rapids one morning this week to watch the trout head upstream for spawning. On Thursday I am planning on taking Sam to West Yellowstone to watch the IMAX movie 'Yellowstone'. Sam is from Cairo, Egypt and has been working in the EDR. He came here 1 week ago and has up to this point only seem 1 mule deer. No elk, no bison. So I will give him a mini tour of the park on our way to West Yellowstone via Old Faithful. I feel bad since he has no car and it would be like me going to Egypt and no one taking the time to take me to visit the pyramids. At this point, after trying to access Blogger for 2 days, I am thinking that dial-up is a dream. The employee computer internet connection I use is extremely slow and it actually takes 10 minutes to get onto hotmail. With a 15 minute computer use limit I try and get on the computer when no one is line waiting to use it. On Thursday night I drove the north loop and got to see one of the Magnificant 7 north of Norris. He was able to stop traffic and still be 50 feet off the road. I assume that the cars that were stopping had come into the park from Mammoth and he was the first bison that they had seen. On the Blacktail Plateau I saw a fox and a lone antelope. The real excitement came when I got to Tower. A grizzly bear was between the parking lot and the campground. A ranger was standing with a group of people and he had his gun out. About 1/8 of a mile up the road I came to stop in another jam when a black bear was roaming around off the road. Unfortunately, the grizzly had started to make his way toward the campground and the ranger was in his vehicle trying to maneuver around vehicles with his lights and sirens. Still the front vehicle would not move. Eventually the ranger demanded the first vehicle move over his loudspeaker. When traffic started moving the ranger gunned his vehicle up the back road to the campground. I'm sure he was very concerned about everyones safety there and was very frustrated by the lack of movement preventing him from getting there. Last night was weiner roasting night at Jackie & Johns. I brought along my laptop and managed to upload only one lonely picture.....and it wasn't even of wildlife. I had a great time visiting with Jackie & John, really nice people. We are hoping to get together on a Saturday in August for an afternoon of white water rafting. I'll have to trade someone a day off since their days off are Saturday and Sunday and mine are Wednesday and Thursday. Grace has already volunteered to switch with me. Today Jim, Genevieve and River stopped into the store to visit me. It was so nice to finally meet them since we've exchanged e-mails. Tonight I was asked by my supervisor to take one of the girls from China to the clinic at Lake. She had gotten a nasty bug bite that was inflamed. I took her and one other girl (I don't even know their names) down there and on our way back it was fun because we got into a bison jam in Hayden Valley. Two wiley bison were butting heads and pushing each other around in the middle of the road. The girls were terribly excited and took a lot of pictures of it. It's nice to be around someone when they experience Yellowstone for the very first time. Further down the road as we exited Hayden Valley we got into another bison jam as one sauntered down the middle of the road. They were just as excited about that one, too. By the North Rim Road we got inot yet another jam but this time it was because two of The Boys of Summer were on each side of the road. They took more pictures there through the back windows and even managed to stop right next to Bill who was down there taking pictures. I have been told that mosquito season here will last for another month. Being from Minnesota I know about mosquitos (laughingly referred to as our state bird). And in Minnesota mosquito season is known as 'summer'. Talking about Minnesota, I have a new co-worker from Minnesota. Mike is a new custodian here, he just started today. I missed dinner tonight with my trip to Lake so I think I will end my evening with my Meriwether Lewis book and a box of Cheez Its. A big 'Yellowstone Hello' goes out to Dave & Sue in Wales, UK. Hope to see you in September. I am currently sitting in an internet cafe in West Yellowstone. After an evening of frustration trying to get on the internet at Canyon I decided to spend part of my day off coming here. That was after driving through a foggy Hayden Valley, slowed to a complete stop for a couple rambing bisons on the road past Mud Volcano, and then stopping at the Old Faithful store. When I turned at Madison and drove about a mile down the road I got to watch a coyote by the side of the road. He was stalking his prey (a ground squirrel) and eventually bounded over a fallen log (that's when I heard the squeak from the squirrel) and circled a burned out tree stump. It appears that Mr. Coyote missed his meal. Further down the road there is an eagles nest. I have seen mama eagle there a few times, and I've also seen the prominently displayed NO STOPPING EAGLES NESTING signs. They are not a deterrent and people were stopping which then created a pile of cars over 2 miles long behind them! I know I will have to face that when I head back into the park. Yesterday, my first day off, I heading into Cody. I needed to pick up supplies for a bonfire/hot dog roast tomorrow night with Jackie & John at their RV. I only made it 2 miles down the road when I was stopped by a bull bison in the road who decided that was just as good of place as any to stand and scratch his ear with his hind hoof. I made numerous other stops along my way to Cody and finally discovered the pull out by Mummy Cave which I've read about. It is an excavated cave that showed over 10,000 years of habitation. Very cool. My next stop was the firefighters memorial for the Blackwater Creek fire from 1937 where 15 firefighters lost their lives and 39 were injured. I took a few photos of the Shoshone River, mountains and the Buffalo Bill Dam. I love the drive to Cody. In Cody I filled up the gas tank. When the fuel started pumping the gas pump actually played the song "I'm an old cow hand from the Rio Grande". Crazy! It put a smile on my face. On my way back toward the park I took advantage of a picnic area.........not for a picnic but to clean my car out (I bought a little broom and dust pan). So there I was under the blue sky, next to the roaring Shoshone River, surrounded by mountains totally loving a totally mundane task. When I got back into Yellowstone I noticed that the winds had really whipped up. I had to stop at the lakeside and video the huge waves that were pushing onshore, and in places they were actually blowing onto the roadway. North of the Fishing Bridge junction I was following a van when 2 trees blew down across the road in front of them. Too close for comfort. Of course the cars started piling up in both directions but a group of men came forward and tugged and pulled and grunted and got the trees mostly off the road. That's when someone presented them with one of the flexible saws with rings at the end. Someone was able to saw through the rest of the tree and cheers rose through the crowd when it was finally moved. There were also audible gasps everytime we heard a tree creak around us, we all hoping no more would be falling onto any of us. With the wind blowing I pretty much figured out that there would be power outages back at Canyon. I was correct. My clock was flashing and eventually the power went out again for about 1/2 hour. One of the Boys of Summer made his way to a little clearing behind the Canyon Visitor Center which created a huge jam right by the junction. I took a picture of all the people that had totally surrounded him. There was no escape for him so luckily for everyone he was completely happy just to graze. Here is a special "Hello!" to Bob & Family in Milwaukee, Richard & Family in Texas and Richard, Genevieve and River. Thanks for e-mails and I will personally reply to them shortly. The organization Buffalo Allies was brought to my attention. Anyone who has followed my blog may realize that the bison hold a very special place in my heart so I will absolutely be looking at that website (buffaloallies.org). Please keep those e-mails coming, I love hearing from people and their experiences in Yellowstone. During my afternoon break yesterday I took my usual cruise through Hayden Valley. I came across an unusual sight. A small pickup had managed to drive about 50 feet off the road. I am assuming the driver was not paying attention to the road. When I came upon it there was about 4 people standing around by the road while the driver was laying across the truck seat with his door open. It was a confusing sight so I turned around to see if anyone needed help. They assured me the driver was fine. I waited around in the nearest pull out until the ambulance and ranger came. Last night I decided to take my usual north loop drive. My first sighting was a coyote trotting along near the clearing just south of the Norris campground. The evening was starting out well. Once in Mammoth I found the usual herd of elk wandering the grassy areas. The elk calves are getting large and their spots are barely visable. The calves lounged in the grass and would twitch their ears and scratch them with their hind hooves as the bugs bothered them. I decided to continue on to Gardiner and stop in at the Yellowstone Association. It was fate. Upon reaching the door I saw a sign taped up that their was a book signing by Lee H. Whittlesey!! Oh joy! Mr. Whittlesey is the author of the book Death in Yellowstone which is the biggest selling book in the park and a book I personally have read 5 times. I had given my copy to to Brandon and I had mistakenly thought he took it with him when he left (I found out last night he did indeed leave it behind in his room for me). I bought a new copy and had Mr. Whittlesey sign it for me. It was an exciting moment to meet an author of a book that I have enjoyed so much. Coming back into the park I saw something that I had never seen before. In all my travels west I had never had the opportunity to see a baby pronghorn. And there along the river was a small herd of pronghorn with babies. My night was really progressing nicely. East of Mammoth I found the bull elk that hangs out in that area. I snapped a really great picture of some guy who thought that getting a video of the elk from 10 feet from it was a super great idea (NOT!) Later when I loaded the picture on my computer I saw that the elk had turned it's head and was giving the guy what appears to be a dirty look. The cars were really piled up behind heading to the west and I had to drive slowly to get buy the elk which was standing 5 feet from the road. When I drove by I looked out my passenger side window and all I could see was huge velvety antlers. My day ended with listening to a coyotes singing across the road from the dorm at 10:45. What a wonderful day. Up until today I thought dear old dad was the only one who actually read my blog. Then at 4:00 this afternoon I was made aware that there are quite a few people who actually read what I'm writing. My first thought was I sure hope I haven't written anything politically incorrect. And then I thought about all those posts where I didn't use spellcheck. I was sitting on the floor in the warehouse unwrapping bobble head bison, elk, bears, eagles, etc. and then hanging tiny Yellowstone signs around their necks (life is not always glamorous in Yellowstone, but always interesting) surrounded by a pile of bubble wrap so high that it possibly had it's own weather system when I'm called to the front of the store by my supervisor. There I met Patty Owens from Illinois. She informs me that she reads my blog every morning and had found it from the Yellowstone Newspaper site. I almost fell over. After a quick recovery and a pleasant chat with Patty I realized that I'm feeling quite inspired again. Frankly, I really didn't think anyone would be interested in whether I was working in Confections or Gifts or if I saw a bull elk or not. I guess I was pleasantly mistaken. As I've mentioned in the past, the Internet here is very slow and sometimes impossible to get onto at times so be patient with me and my replies to you. And since I am newly inspired about my blog again I took a drive after work to look for wildlife so I would have something more interesting to write about than my mandatory dorm meeting tonight. My first sighting was pretty obvious: a bison walking down the middle of the road north of Norris. He could possibly of been one the bison's from the group that I've nicknamed 'The Magnificent 7'. That would be the group who seems to really relish holding up traffic in that area. Later on, at Hanging Island Lake, I saw 'The King of Sloppy Eaters': a bull moose. He was wading around at the far edge of the lake eating and dripping water from his mouth. He was just developing a nice rack and he was actually my first moose I've seen feeding in the water. To make it more interesting 3 mule deer walked down to the lake on the eastern side. I passed a bear jam on the south side of Dunraven Pass but it was up on a slope and because my car roof isn't invisible I wasn't able to see it. I just drove on back to Canyon as it was getting dark. This morning as I was sitting outside the dorms on the back steps and I looked to my right and realized a mule deer was strolling by. He stopped and looked at me and made a little deer noise and strolled on. There have been a few mule deer hanging out by the dorms lately. One of The Boys of Summer has been holding up traffic by feeding and lounging by the turnoff to Inspiration Point. He's gorgeous. Later in the day, during my afternoon break, I sat at the picnic table outside and listened to the thunder as a storm came through. Yesterday morning I got up early and Carl and I went for a hike on the North Rim Trail. We picked up the hike where we left off a few weeks ago. We started off by hiking down to the brink of the Lower Falls. The water is flowing hard and fast and it roars loudly. We finished the hike at the brink of the Upper Falls. What a great trail to hike. Then it was off to work in grocery. It was extremely busy in the grocery section, as it always is. And finally, thanks to Yellowstone Newspaper. Thank you for finding my blog interesting enough to comment on and put on your site. We celebrated the 4th of July with Crazy Hat Day. I made a hat that looks like a dual celebration hat: 4th of July and Kentucky Derby. I guess my hat was a hit as my co-workers and even some guests took my picture. The store was suprisingly slow today. Weekends are usually slower than weekdays so none of us knew what to expect today. For lunch the EDR provided us and some of the park rangers with a BBQ. There were all the typical 4th of July fixin's such as hamburgers, beans, watermelon, and potato salad. The EDR was decorated with all sorts of streamers, flags and banners. It was great and I took a lot of pictures throughout the day. This morning I decided to take a quick drive through Hayden Valley. I saw a large herd of bison moving across the valley. I took a moment to watch and realized that even without fireworks I was probably looking at one of the most American scenes possible: Yellowstone and the bison. Now that's a nice 4th of July experience. Since I hadn't been to Grant Village yet this year that is exactly where I went yesterday. The store there is beautiful and I love the layout. I also like the look of the store in Fishing Bridge. That store has an outdoor feel to it. The main attraction there is a huge stone fireplace that has a fire in it on cooler days. Grant was just remodeled and it's look is much more up-to-date. The Canyon store has been remodeled twice in the past 7 years. The theme here in Canyon is much different from the rest of the stores in the park. Our theme here is about the 1950's & 1960's when cars were becoming much more popular inside the park. It's nice but somehow seems a little out of place with all the natural beauty around. After my stop at Grant Village I headed off to West Yellowstone. Once I got there I was a bit disappointed in myself for not remembering to pick up my free tickets to see the Yellowstone IMAX movie. I will have to remember to get my ticket and just put it in my glove compartment. Feeling a little daring I decided to head back to Canyon through the road construction instead of going back the way I came (by Old Faithful and by Lake Yellowstone). A new bridge is being constructed by Gibbon Falls between Norris and Madison. There are possible 30 minute delays since there is a section with only 1 lane and the road closes at 10:00 pm until 8:00 am every night as the night crews work. In August it will eventually close permanently for the season. Some of the crews stay at the Canyon RV park so I've gotten to visit with a few of the workers and they give my updates on their progress. It's amazing to see the huge equipment that have been moved in, some of which are up on the cliff over the current roadway. Anyway, I only had a 5 minute wait (I timed that right) so I was glad I decided to head that direction. I took a couple pictures of the construction. Since my wildlife viewing has been rather lackluster lately (warm days and working until 9:30pm) I took the north loop last night. I saw a grizzly by the Blacktail Lakes and another one by the Chittenden Road at Mt. Washburn. Then I was off to the fireside ranger talk which was about the 'greening' of Yellowstone. The talk was about all the recycling program within the park and using reusable resources. It was interesting and made me appreciate all the trash sorting I do..............there are recycling bins everywhere and I had to attend a company talk strictly about the company policy on recycling and the use of chemicals. I will be busy today at work. A man from corporate (Buffalo, NY) will be in the store tomorrow. Everything needs to be stocked, polished and shiny. I have been working the late shift this week and I've been having problems getting on the computer after work. With today off I managed to get to the computer while early shift is at work and late shift is still sleeping. The big news that people are still in shock with is that Brandon left on Sunday without saying goodbye to anyone. No one had a clue he was gone until Jean came to the dorm Monday morning looking for him when he didn't show up to work. When he didn't answer his door she opened it and found in cleared out with his uniform laying on the bed. We are all in shock and miss him. Shirley had to leave last week when her cousin was near death. Brandon was the 4th person to leave so far this year. Luke leaves July 15 so Jeannie and I decided to plan his party. Last night we had a surprise going away part (a scheduled leave) for Tracy and Lavender. The will be touring the US and then they will go back to China. Linda, Mickie and Jeannie had a cake made at COSCO and they received presents. Tracy cried she was so touched. They were given pink Yellowstone aprons and we all signed them. They are adorable and everyone loves them. Yesterday I went to Cody via Sylvan Pass. The purple flowers are in bloom along the side of the roadways and the Shoshone River is flowing hard and fast. It is a beautiful drive in the canyon just outside of the park. It was very warm (85 degrees) and I caught some sun while driving along. In Cody I only made 3 stops: Family Dollar, Sierra Trading Company and Walmart. The 4th of July is Crazy Hat Day in the store so I stopped at Family Dollar to pick up some decorations for my hat (a cowboy hat supplied by the company). Using my park employee discount I bought a couple pairs of pants at Sierra Trading Company. With all my walking around at work I appear to have lost some 'insulation' and I got tired of having to hike up my pants. And then Walmart was for their Mt. Dew sale and laundry detergent. I work the late shift on the 4th of July. I worked on my crazy hat last night and I made sure others were wearing hats.........I certainly didn't want to be the only one to make and wear one. The NPS employees were invited to our picnic outside the back of the store. I guess the EDR cooks are expecting quite a showing for the picnic. There have been a few employees that have been sick lately. It has been spreading through the dorms. I have been lucky and haven't caught anything yet. A few people show up and then get sick with altitude sickness but I managed to miss that, too.